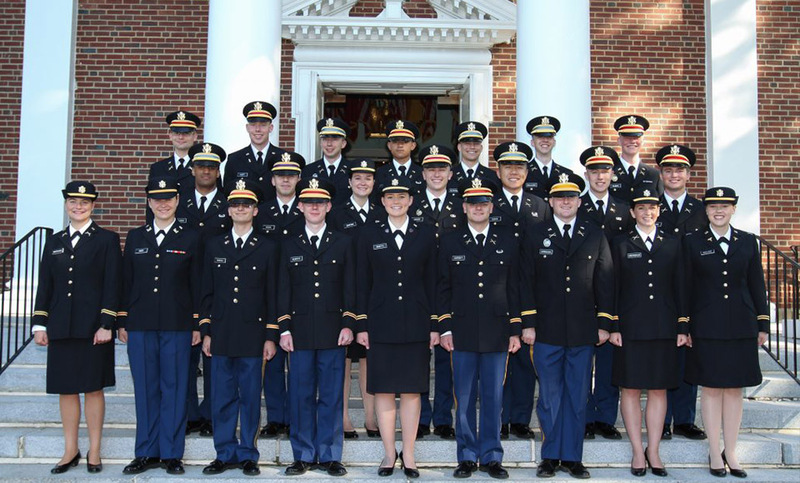 Through Valley Forge Military College’s Army ROTC Early Commissioning Program, you will become a second lieutenant at the end of your sophomore year. This is a rare and prestigious opportunity, and Valley Forge Military College is the only college in the northeastern United States that can make it possible for you. Early Commissioning Program (ECP) cadets at Valley Forge are, without a doubt, the top of the Corps of Cadets. Many hold leadership positions, including Regimental Executive Officer, Infantry Battalion Commander, and Regimental Sergeant Major. Academically, ECP cadets are out front as well. ECP graduates can be found throughout the U.S. Army, leading American soldiers and representing Valley Forge. If you are accepted to this program, your opportunities upon graduation are best-in-class. As graduates, newly-commissioned second lieutenants serve in National Guard or Army Reserve units as platoon leaders while they complete their bachelor’s degrees at colleges and universities around the nation. During their senior year at their follow-on university, lieutenants who are eligible may compete for active duty with ROTC students in their cohort. When cadets receive their bachelor’s degree, they will continue to serve in the National Guard, in the Reserves, or as active duty in units across the country, around the world, and, in some cases, in combat zones in Iraq and Afghanistan. Click here to view Frequently Asked Questions about the Early Commissioning Program. The application process for Fall ’19 start for ECP is now closed. You can apply for a Fall ’20 start beginning July 1, 2019. You can send the packet to the address listed on the VFMC Army ROTC ECP Application. Once we have assessed your credentials, we will contact you for the next step. National Winners of the Early Commissioning Program Ike Skelton Scholarship may choose which one of the four Military Junior Colleges they would like to use their scholarship to attend. Financially, VFMC is a great choice because the school grants a room and board scholarship to all students that contract with an Ike Skelton scholarship. That means that you will be able to pocket most, if not all, of your $450/500 per month stipend, $1200 per year book allowance and approximately $300 per month drill pay as a college student. VFMC is also located in one of the premier locations in the country to go to school with at least 13 colleges and universities also located in the surrounding area in a suburban region just 15 miles west of Philadelphia. Our cadets have a record of excellence at VFMC. This year our cadets earned first place honor among Military Junior Colleges at the brigade’s annual Ranger Challenge competition taking place every fall at Ft. Knox. We also had 5 cadets compete at the NJCAA National Cross Country Championships. Upon graduation, many of our cadets go on to complete their Bachelor’s degree at top tier universities to include: Cornell, Columbia, William and Mary, Baylor, Syracuse, Villanova, Penn State, Norwich, Ohio State, Pitt, and many others. If you would like more information, contact the Senior ROTC Recruiting Operations Officer at: kfluck@vfmac.edu or 610-989-1445. Congratulations on receiving a National Board ECP scholarship offer! The following paperwork is necessary for us to have on file in order to slot you for Basic Camp this summer and for you to contract into the Army in the fall. Original Birth certificate and Social Security Card (Policy states that we must make the copy of the original to ensure no tampering or altering of the document. I will return the original via FEDEX and provide you the tracking #). Army ROTC ECP Scholarships at the Military Junior College are awarded to students by the Professor of Military Science or through the Army National Board. Students interested in applying for Army ROTC ECP Scholarships should contact the VFMC Army ROTC Department at (610) 989-1445 or via email to Karen Fluck, Recruiting Operations Officer, for more information. You can also apply to ECP by going to goarmy.com and listing Valley Forge Military College as one of your choices. Army ROTC ECP Scholarships are awarded based on a student’s merit and grades, rather than financial need. In addition, Valley Forge Military College will provide a grant to cover Room & Board while attending VFMC. Complete specific military training prior to entering the ECP at Valley Forge. (Most cadets attend the four-week Basic Camp at Fort Knox, Kentucky during the summer before they arrive at Valley Forge.) Soldiers who have completed Basic Combat Training are pre-qualified and may not need to attend Basic Camp. Be a U.S. citizen of good moral character. ECP cadets undergo a rigorous course of instruction during their two years at Valley Forge. In addition to their regular academic course schedule, cadets take a Military Science and Leadership (MSL) course each semester. The MSL curriculum consists of classroom instruction, a weekly leadership lab, physical training, and weekend training conducted three times per semester. Weekend training is focused on developing critical thinking adaptive leaders through situational experiences grounded in Army doctrine. During the summer between their freshman and sophomore years at Valley Forge, cadets attend the five-week Advanced Camp at Fort Knox, KY. In addition, cadets may compete for and attend the Airborne Course at Fort Benning, Georgia, the Air Assault Course at Fort Campbell, Kentucky, may spend several weeks with an active duty Army unit in the Cadet Troop Leader Training (CTLT) program, or travel to a foreign country to train foreign soldiers in the Cultural Understanding and Language Proficiency Program (CULP). Following summer training, cadets return to Valley Forge where they prepare for leadership experiences as a platoon leader. In addition to required training, cadets may participate in optional training. The Ranger Challenge team competes annually – and very successfully — against Military Junior and Senior Colleges and universities in the 1st Brigade. Last year our team placed first among Military Junior Colleges. In order to be eligible for commissioning, cadets must maintain a 2.0 cumulative GPA and graduate with an associate’s degree, must pass all MSL courses with a cumulative MSL GPA of 2.0, must complete Advanced Camp, must pass the Army Physical Fitness Test (APFT) and the Combat Water Survival Test (CWST), and must pass a military history course.